I have just marked an important milestone at the start of this month. This month marked 1year stable in mental health journey. This last year has been a great time of learning as well as growth for me. I am filled with happiness and gratitude that I have been so blessed to get to this point. This was not an easy journey and as I look back on the there were so many instances that could have allowed this story to end up another way. At the beginning of this journey year I was not seeing a therapist. I had been seeing a therapist several months prior who, I decided to stop seeing. I felt he did not have my best interest in mind. He was opinionated and forced his opinions on me instead of allowing me to draw my own conclusions and make my own connections. I felt it in my gut that this was not the “therapist” for me. I did however see my psychiatrist regularly (every 8 weeks) for prescription maintenance. When I finally decided to get serious about my mental health and mental health care routine, I knew that finding a therapist would be paramount to my recovery. There were several reasons why I had in the past no stuck to the routine of regularly going to therapy. One of them was cost. 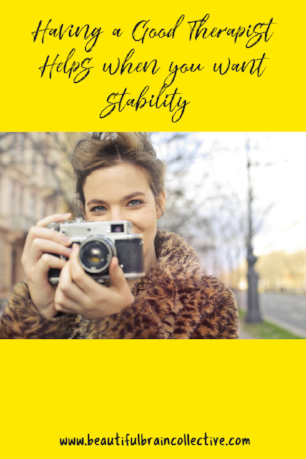 I did not want to make the investment into myself and commit to getting well and learning the coping skills that I needed to maintain a stable lifestyle, and the second reason was that in the past I was very inconsistent. I would see a therapist for a few months, and then fall off, because I may have felt better or thought that everything that needed to be addressed was already addressed. This time was different. I was on a rollercoaster that did not stop, and I was tired of the ride. I wanted off. I wanted to bring myself some sense of normalcy. I wanted most amount of normal that I would be able to get considering my situation. If you have ever had to find a therapist, it is no easy task. It is quite grueling. It is not one of those things where you just call up and schedule an appointment like you would do with let’s say a massage. I wasn’t just looking for someone with the credentials or the degree, I was looking for a connection. I wanted a therapist who would be able to connect with me on a deeper level. A level that they would be able to get through to me and help me understand my illness and many of the past traumas that I had to endure as well. I did massive research on the providers in my network and as it goes, I would leave a message asking if they were accepting new patients, and if they were doing they have any openings that would fit my work schedule. I spoke with several candidates over the phone to see if I could get a sense of what their energy would be like in person. I used other patients reviews as a guide in assisting me with choosing a possible therapist. Again, this was no easy task. I also visited the websites of the individual therapists to get a feel of who they were and what their practices were like. I finally found my therapist after several phone calls and internet searches. After the 1st session, I knew that I really liked her and that she would be a great big help to me. I did not know the half of it. She was more than a great help. She was not a person that I would just go and see every week and pay a hefty co-pay to. She became my magnifying glass. Her skills and techniques allowed me to look at myself and behaviors in a way that I had never looked at them before. I was more than just another body on a sofa to her. One of the things that I learned for sure when you decide to take the journey on the road to stability is to find a good therapist. Good does not necessarily mean the number of degrees or anything like that. When I use the word good, I am talking about someone who feels right for you. How does this therapist make you feel? Do you feel comfortable to share your inner most thoughts with them, and, are they equipped and experienced to deal with your diagnoses? These are two key concerns to keep in mind. I can say for sure that when you make the decision to make your mental health a priority, the mental health care team that will be caring for you is very important in the management and care of your illness.